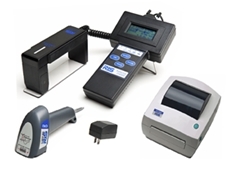 RJS Technologies, Inc. is the manufacturer of the Inspector series portable bar code verifiers. The Inspector series portable bar code verifiers are accurate, repeatable devices that are used world-wide to ensure bar codes will work throughout the supply chain.Simple, reliable tools that can handle the stress of an industrial environment for many years are some of the hallmarks of the Inspector series. The D4000 firmware is not field upgradeable and the cost is $100 (if unit is under warranty, out of warranty units are charged the standard flat-rate service fee in addition to the $100) or may be requested when RJS services your bar code verifier. The VCIR upgrade is available at no charge (for existing VCIR customers) and can be downloaded from: VCIR_Software.zip. It has come to our attention that ShenZhen Aosun Barcode Technology Company Limited, with a website of www.aosuncode.com, is manufacturing and selling UNAUTHORIZED counterfeit bar code verifiers bearing the RJS logo and closely matching appearance. Inspection of bar codes using a counterfeit unit does not provide companies with protection against fines, penalties, or product rejection. RJS may provide, at our discretion and without charge, a replacement authentic RJS bar code verifier for all counterfeit units returned to RJS for exchange. If you suspect that you may have been sold a counterfeit unit please complete the RMA form (http://www.rjs1.com/rma-request/) and request a replacement unit in the “brief explanation” field. RJS has a long history of product development. Here is the timeline of products since the first verifier back in 1975.